Millionaires, mediocrities and militarists — a sneak preview of the Democratic Party’s new fall lineup. So what can the party’s voters expect if these lucky individuals are voted in? The list — much like the party’s picks in general — tends towards military veterans and former officials, particularly if they happen to be business owners, wealthy, and well-connected. Here’s a brief rundown of some of the more notable names on the list. 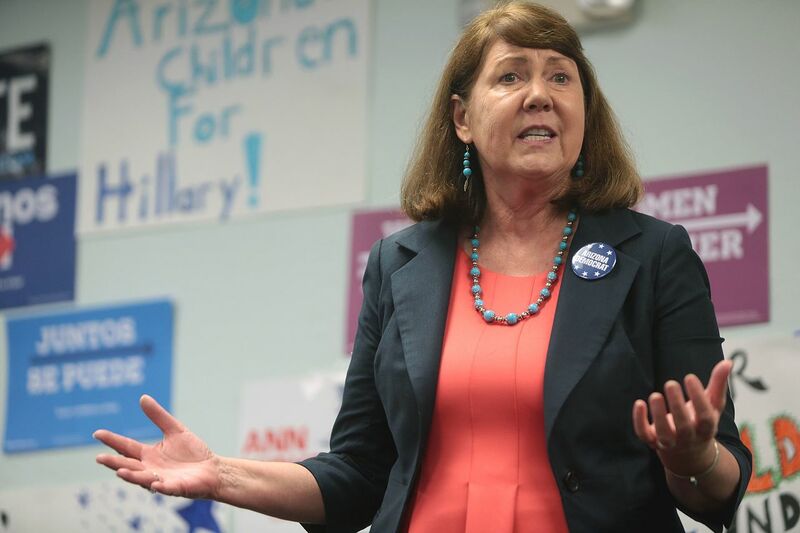 This won’t be Ann Kirkpatrick’s first tilt at a congressional seat — she served twice in Arizona’s First District, from 2009-2011 and 2013-2017, before losing her bid to unseat John McCain. She’s now hopped over to the Second District in an attempt to take it for the Democrats. This isn’t her first time on the DCCC’s Red to Blue list, either; she appeared on it back in 2008. The results then weren’t encouraging. Kirkpatrick voted against cap and trade and closing the prison at Guantanamo Bay, a measure that failed by a single vote. A deficit hawk and supporter of a balanced-budget amendment, Kirkpatrick nonetheless joined Republicans to extend the Bush tax cuts, and railed against Wall Street greed while voting against the Dodd-Frank financial regulation bill. Years later, she voted to weaken them. So where does Crow get his money? His top contributor by far is Holland & Hart, the law firm at which he is a partner, and which also happens to do lobbying for a wide variety of corporate clients, such as the American Gaming Association, and a host of mining and fossil-fuel companies. In an added twist, it turns out that the firm lobbied against gun-control measures following the Aurora shooting (which took place in the district) on behalf of the National Shooting Sports Foundation and firearm accessory maker Magpul Industries. He also received $5,400 from Bain Capital, which Democrats considered the most evil company on the planet when it was politically convenient. You can decide for yourself if taking money from a firm that lobbies for corporate clients makes a mockery of Crow’s pledge or not. But it’s worth noting that during Crow’s time at the firm he defended a predatory payday-lending firm and a fossil-fuel company charged with killing migratory birds. As for what Crow actually stands for, good luck finding out: his “values” page is mostly strategically vague twaddle that seems more focused on shoehorning in references to his military service than talking about specifics. Like many on this list, Davis is also running on gun control, but it’s not clear he’s best positioned to do so. During his twelve years in the Kansas House of Representatives, Davis voted to bar cities and counties from regulating firearms (and helped override the governor’s veto to do so), supported a bill that blocked federal regulations on firearms made and owned in the state, and voted to forbid the use of state funds for lobbying on gun regulations, earning him a respectable B rating from the NRA in 2014. As DCCC literature itself trumpets, he’s “built a strong, centrist brand” in the state, which means he’s supported some conservative measures (drug testing welfare recipients, cutting more than $1 billion in spending during the recession, reducing the corporate tax rate) even as he’s taken laudable positions (supporting abortion rights and marriage equality while opposing the expansion of coal plants, various anti-union bills, and cuts to teacher job protections and unemployment benefits). The DCCC is betting that this — along with Davis’s fundraising prowess — will be enough to secure him the conservative district he’s running in. But Davis appears to be repeating his strategy from the 2014 contest for the state’s governorship, in which he seemed a shoo-in against the incumbent, the preternaturally unpopular supply-side mad scientist Sam Brownback. In that race, Davis appeared pathologically disinclined to present an actual platform, content simply to point out the bad job Brownback was doing, talk up his love of public schools and bipartisanship, and tout his many, many GOP endorsements. Even as he railed against Brownback, he promised only to freeze his tax cuts rather than repealing them. His strategy foreshadowed Hillary Clinton’s in 2016, and scored an identical success rate. Davis lost in a squeaker, somehow managing to trail Brownback among nonwhite voters. Still, he carried the district that year. Elissa Slotkin, the “hot dog heiress,” is among this year’s Democratic challengers being backed by the “moderate” New Democrat Coalition, which seems about right when you look at her website. Slotkin mixes a few progressive positions — favoring marijuana decriminalization, a promise to empower Medicare to buy drugs in bulk, an insistence that entitlements be protected — with paeans to fiscal responsibility and a reluctance to support Medicare for All. But for the groups that recruited her, including Emily’s List and the DCCC, Slotkin’s main selling point is also her chief red flag: the more than a decade she spent in the national-security establishment, first in the CIA, then in George W. Bush’s National Security Council, and finally in Obama’s State and Defense Departments. At her 2014 nomination hearing for the post of Assistant Secretary of Defense for International Security Affairs, she called John Negroponte — the first postwar ambassador to Iraq, who had earned his stripes by covering up the abuses of Reagan-backed right-wing forces in Central America — an “exemplary boss” who embodied “ the meaning of committed leadership,” and that she hoped to live up to his expectations. If Slotkin wins, she’ll likely be a reliable supporter of the national security status quo. She’s boasted that one of her responsibilities as acting assistant secretary of defense was maintaining Israeli military supremacy, and was a big supporter of military assistance to Ukraine (which may well have included training the neo-Nazi Azov Battalion). When asked by John McCain if the surge in Iraq worked, she called it “the catalyst that turned the tide in Iraq,” and said she “supported it because I lived it,” having worked in the National Security Council when the administration decided on the surge. For the record, most experts disagree with Slotkin’s assessment. One of the few on this list running a second time for the same seat, Angie Craig is a former executive at St. Jude Medical, a multinational medical technology firm headquartered in Minnesota. Her previous run in 2016 against the now-incumbent Republican, then a right-wing shock jock, didn’t go so well — Craig outspent him four to one and still lost. If all this doesn’t excite you, don’t worry — there’s no one less enthusiastic about Craig running as a Democrat than Craig herself. “You won’t find the word ‘Democrat’ on my campaign literature. You won’t find it on my TV ads,” she’s said. When her opposition tried to criticize the fact that she ran the St Jude Medical PAC from 2011 to 2015 (when she left the company), she had a ready rejoinder. “I sort of chuckle,” she said, “because the PAC donated far more to Republicans than they did to Democrats.” Some of her supporters will tell you Craig made the PAC more favorable to Democrats, but in fact, its giving was far more pro-Democrat before she took over, at which point it started tilting wildly toward the GOP. Craig’s company was prolific in the lobbying field while she served as an executive there. In recent years, it spent millions of dollars to lobby against the 2.3 percent tax on medical-device supplies. It supported the TPP and opposed the Employee Free Choice Act, a major piece of pro-union legislation that Obama abandoned in 2009. It lobbied on the 21st Century Cures Act, a bill co-written by the medical device industry that sped up the FDA’s approval process for medical devices. It regularly lobbied on regulatory process reform in the FDA, including in support of a law that would have added “promoting economic growth, innovation, competitiveness, and job creation” to the FDA’s mission. You will be shocked to learn Craig doesn’t support single payer either. Ashford is one of the more high-profile names on the Red to Blue list, due to the controversy over the DCCC’s decision to back him over his progressive primary opponent, Kara Eastman. In Nebraska’s state legislature, Ashford had voted as a sort of liberal Republican, on the one hand introducing bills that repealed corporate taxes and barred businesses from hiring undocumented workers, while also opposing an Arizona-style immigration crackdown, supporting gay rights and gun control, and backing a bill to repeal the state’s death penalty. At some point, Ashford became a Democrat, and in 2014 he knocked out sixteen-year GOP incumbent Lee Terry thanks largely to an intense get-out-the-vote effort that year by supporters of a successful ballot initiative to raise the minimum wage, which attracted Democratic voters to the polls on Election Day. Ashford was sent to Washington, and within less than a month of being sworn in made good on his promise to work with the Republicans, voting with them to pass six bills opposed by his own party, including a repeal of Wall Street regulations, a lobbyist-backed repeal of Obamacare’s thirty-hour week definition of full-time work, and a bill authorizing the Keystone XL pipeline (after the League of Conservation Voters Action Fund endorsed him, no less). Other highlights of his time in Congress included voting for a homeland-security funding bill that would have repealed DACA (“National security does trump that issue,” he explained), voting against the Iran deal and against closing Guantanamo, and supporting a bill, opposed by civil-rights groups, that allowed racial discrimination in auto lending. Perhaps it’s no surprise that the voters who turned out to elect him in 2014 seemingly abandoned him two years later. But while Democratic voters may not be particularly enthused about another Ashford win, with his stated philosophy of “ratcheting back a lot of the regulation and letting businesses grow,” Trump will no doubt be pleased. One would think a lawmaker who’s achieved the NRA hat-trick — an endorsement, a 100 percent rating, and a donation (which he also got from several other gun lobbies) — would be a risky bet in a year where grassroots anger over gun laws is swelling and Democrats are stressing gun control as a key issue. But the DCCC doesn’t think so; it’s fully backing Jeff Van Drew, who has been described by one local Democratic official as a “transactional politician” and in some ways more conservative than the retiring Republican. Transactional indeed. One of the first things Van Drew did as a state legislator in 2003 was lend a hand to fellow lawmaker Joe Roberts, who wanted to pass a bill allowing optometrists to carry out surgeries, something only medical doctors with years of training and residency were legally permitted to do. The fact that Roberts was heavily invested in the optometry industry was no doubt just a coincidence, but the conflict of interest led him to withdraw the bill. Soon, Van Drew — who had received almost all of his campaign donations from a PAC chaired by Roberts — put forward an almost identical bill, before withdrawing it, too, in a hail of controversy. Besides this, over the years Van Drew has voted multiple times against raising the state’s minimum wage; voted against abolishing its death penalty — then, years after its repeal, attempted to revive it; sponsored a Chris Christie-backed bill to end affordable-housing quotas; was the only Democrat to vote against letting undocumented immigrants benefit from state financial aid; opposed marriage equality; supported pulling the state out of the Regional Greenhouse Gas Initiative; and put forward a constitutional amendment that would open the door to parental-notification requirements for abortions. Sounds like the perfect candidate to run in a district described as leaning Democratic. Susie Lee might be best known as the millionaire philanthropist whose vast resources led EMILY’s List, infamously, to endorse her over Nevada assemblywoman Lucy Flores in 2016. Despite finishing third that year, Lee is giving it another go with the DCCC’s backing and at Harry Reid’s urging. Lee reportedly backed a $15 minimum wage and an expansion of Social Security in 2016. The “economic opportunity” section of her current website, however, doesn’t mention either. She was also the only major Democratic contender that year to oppose the Iran deal. Lee faced a minor controversy over not just her extreme wealth (Lee and her husband, a casino executive, own seventeen homes and a plane) but for their investments: their account manager put money in companies like Wal-Mart, Halliburton, and a private-prison company, which they’ve since divested from. Chrissy Houlahan hits just about every beat necessary for today’s Democratic Party: she’s a veteran, a businesswoman, taught at an inner-city school, started a nonprofit devoted to teaching kids literacy, and doesn’t back Medicare for All. While it’s not on her website, Houlahan has at least said she’d support a government public health-insurance program, which is a more interesting answer than the usual vague platitudes to “improve” Obamacare that the rest of the DCCC’s picks present. Unlike most on the DCCC’s list, Ben McAdams has a decent record. As a Salt Lake City mayoral aide he worked to ensure passage of ordinances against LGBTQ discrimination and even succeeded in getting the anti-gay Mormon Church to sign on. One of his first acts as Salt Lake County mayor was to give public employees their first (modest) pay rise since 2009, restore retirement benefits cut the year before that, and add autism to their health-insurance coverage. He also prioritized reforming the county’s “broken” criminal-justice system, took heat for declining to give Facebook a $240 million tax handout to build a wasteful data center, and struggled to build new homeless shelters in the face of ferocious opposition from county neighborhoods, costing him a ten-point drop in approval ratings. McAdams even spent three days undercover as a homeless person to find out the state of the county’s shelters. But there’s another side to his record. A legislator who spends a lot of time talking about “efficiency” and “fiscal responsibility,” McAdams has generally refused to raise taxes. Maybe that’s why in 2015 he proposed, before subsequently dropping, plans to cut public employees’ retirement benefits to pay for his initiatives. He’s also enamored with public-private partnerships, working with Goldman Sachs to bring special-education programs to Salt Lake County — for a profit. The New York Times later found that while Goldman Sachs collected a healthy profit from the venture, the results were overstated. Undeterred, McAdams continued to push for similar programs to deal with prison recidivism and homelessness. Lisa Brown is another departure from virtually the entire Red to Blue list, having actually built a solid progressive record during her more than two decades in the Washington state legislature. Brown started out as an activist, organizing the first “Take Back the Night” march in Spokane, joining the “Molar Majority” movement for dental care for the poor, and protesting against Reagan’s actions in Nicaragua before going on to teach economics. Her first campaign, in 1992, saw her tarred as a Marxist and nicknamed “Sandinista Lista.” In response she insisted she taught capitalism, and nothing in her record since then suggests she’s actually a radical. Still, Brown, who in 2003 became the first female majority leader, has a good track record. Under her leadership, the legislature passed an LGBTQ anti-discrimination bill after thirty years of trying; steered money toward schools, teacher salaries, and other educational programs; repeatedly expanded the state’s health care coverage for lower and middle-income families and others; expanded food-stamp coverage; and started a program that sends payments directly to working families, to name a few. The recession, and subsequent demands for austerity from the state’s GOP and its Democratic governor, shelved further initiatives and threatened to undo these efforts, targeting the state’s subsidized health insurance and student financial-aid programs in particular. Brown fought the cuts and encountered a firestorm of resistance when she proposed averting them by introducing a “high earners income tax”; the state’s purely sales tax-based system, she complained, was the most unfair in the country. Instead, she was forced to settle for measures watering down a series of austere, regressive budgets, often battling other, conservative Democrats. Despite her accomplishments, Brown appears to be running a deathly boring campaign for the Fifth District, eschewing populism in favor of promises to further local economic development and to be more accessible than her opponent. When asked if she would ban AR-15 rifles in the wake of the Parkland shootings, she demurred with what can only be described as waffle, and suggested that Congress instead form a bipartisan commission to find solutions. Her stance on single payer is equally confusing: her website claims she wants “affordable and comprehensive universal health care,” but she’s also said she simply wants “universal access” and appears to be refusing to commit to Medicare for All. An internal poll from February places her within four points of the GOP incumbent.